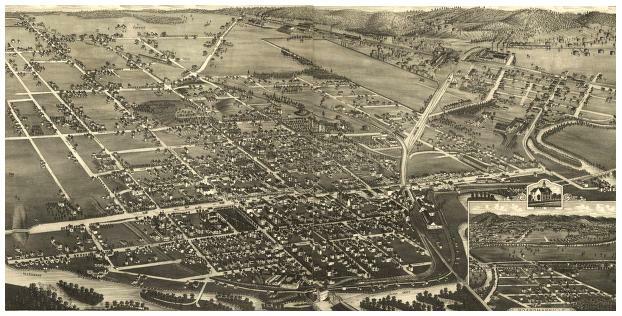 Olean was formed March 11, 1808, and at first included the whole territory of Cattaraugus County. "Ischua", now Franklinville was taken off in 1812, a part of Perrysburgh in 1814, Great Valley in 1818, Hinsdale in 1820, and Portville, in 1837. It lies upon the south line of the county, near the southeast corner. The surface is a hilly upland, separated into 2 distinct parts by the valley of the Allegheny. The highest points are 500-600 feet above the valley. Lumbering is the major occupation. 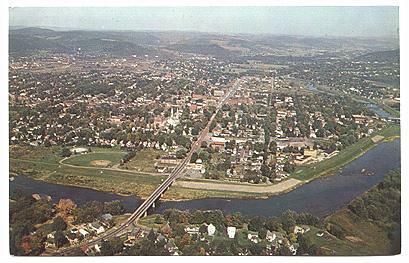 Olean is on the Allegheny, at the mouth of Olean Creek, and was incorporated in 1854. It contained in 1863, 6 churches, the Olean Academy, a newspaper office, a flouring mill, foundery, tannery, and 3 sawmills. Its population was 994. It was a station on the New York and Erie Railroad, and an important comercial point upon the river; and it was for some years the southern terminus of the Genesee Valley Canal. The first settlement was made in 1805. In that year, Robert Hoops, agent of Adam Hoops, and David Heusten were residents near the river on small improvements, and must have settled as early as 1804. Other early settlers included John Brooks, James Green, Cornelius Brooks, William Shepard and Willis Thrall located in 1806. James G Johnson was the first settler in the village, in 1808. The first birth in town was that of Olean, daughter of William Shepard, May 22, 1807 and the first death was that of William B Shepard, Sept. 21, 1809. Sylvanus Russell kept the first inn in 1808 at Olean Point. Levi Gregory kept the first store, in 1811 at Olean Village. The first sawmill was erected in 1807 by William Shepard and Willis Thrall, on Olean Creek. Adam Hoops erected the first gristmill on the mouth of the creek in 1809. Mr. Hoops was a proprietor of lands, and a pioneer settler. He had served with distinction in the Continental Army, and was at one time an aide to General George Washington. If you are fortunate enough to be able to visit Olean, the OPL is a GREAT resource. They have Newspapers from 1856, Some City Directors from 1882, in addition to the Federal Census on microfilm, they also have NY State census for Olean for years 1855, 1865, 1875. 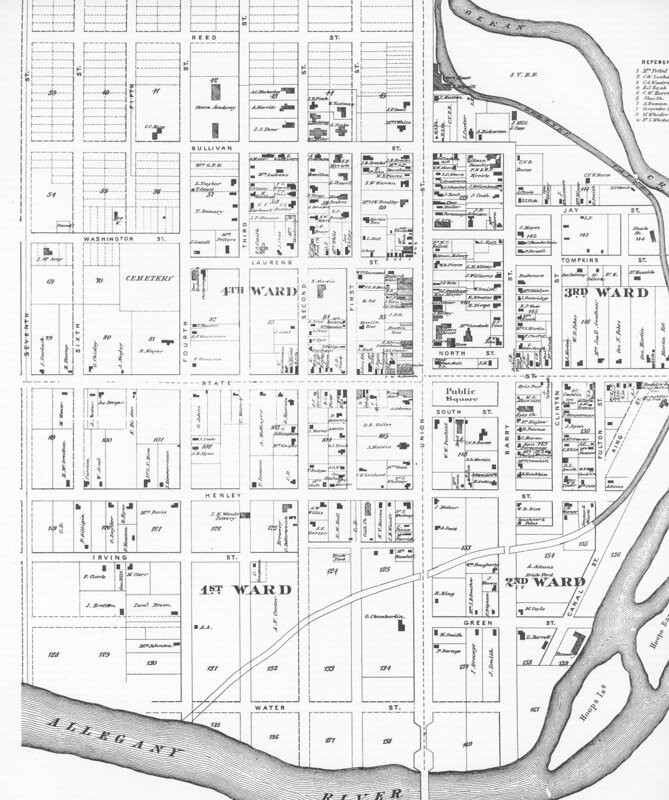 City Ward Map. I don't remember where I got this, and I don't know the date, but here is a partial map of early Olean showing the locations of census wards one through four as well as some early buildings and street layouts. Mostly the west side of Olean. The map will open in a new window and you will have to "close" it when done. It is large and may take some time to load. The Sand Pumpings is hosted on the web site of the New York Heritage which is a research portal for students, educators, historians, genealogists. Sand Pumpings magazines provide a wealth of information for genealogists, researchers, and local historians. In these little magazines readers will be able to learn about various local history topics such as different ethnic groups that settled in the area, stories of the Underground Railroad, the oil industry in Western New York, as well as local celebrities and first-hand accounts of the Influenza Epidemic of 1918 and Prohibition. Thanks to Laura Greene for pointing us to this excellent resource. Union District School No. 1. Union District School No. 5. Union District School No. 6. Photos and Family History Files. Anne KlimczykWalsh of the City Historian's Office has made arrangements to allow us to transcribe the 1893-1894 City Directory. It includes about 12,461 residents, organized alpabetically by household groups and includes occupations. Also included is a Business Directory with Lodges and Societies, a Street Listing, an image of the fold-out map that was on the inside cover, and a Municipal Directory with Ward boundaries. Pages are transcribed into text to allow search enginges (like Yahoo and Google) to locate names, and each transcribed page has a link to the actual scanned 800x1200 jpg image. Decembe 28th, 2017 - An attempt was made to verify all the above email addresses by sending each an email. Those that responded are marked with a . Those that didn't respond are marked with a . You can move your mouse over the green ball to view the date the email address was verified. The only OLEAN listings on-line that we are aware of are on-line on the Olean Public Library. Click on Olean Public Library , then click on Genealogy, then click on Cemetery Listings.